From the worldwide leader in vintage Rickenbacker® restoration parts, we bring you a brand new, dual-jack jackplate for your Rickenbacker guitar. 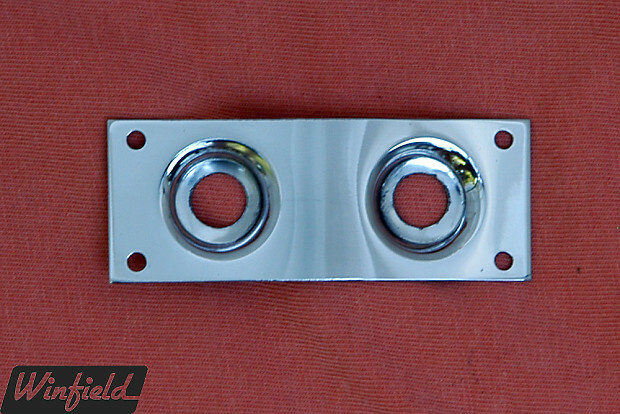 Made of mirror-polished, chrome-plated steel, this jackplate could be the elusive final piece in your restoration project. And yes, we include the four mounting screws. The jackplate measures 1.15" wide x 2.88" long. The screw holes are on .825" x 2.5" centers -- which means that you can also use it as a drop-in replacement for a Rick-O-Sound jack on a 360, 625, etc. And yes, it's pre-curved to fit the body of your guitar. Most orders will ship via insured USPS Priority Mail within the United States. Default shipping to other countries is via USPS First Class Mail (limited tracking and no insurance; any loss, damage, or delivery failure when using uninsured shipping is the sole responsibility of the buyer.). International shipping via USPS Priority Mail or USPS Priority Express Mail is available upon request and at additional cost. Any customs duties, import fees, taxes, or tariffs on international shipments are not included in shipping costs, and are the sole responsibility of the buyer. Guitar cases will ship via UPS Ground unless you request (and pay for) a different service.